I have been using the Kelty Camp Pillow as my backpacking pillow since I started backpacking. It has been great to have along, but I always wondered if there was something a little better… By this I meant something lighter, smaller, and more comfortable. So, the other day I decided to step out and try out something new. 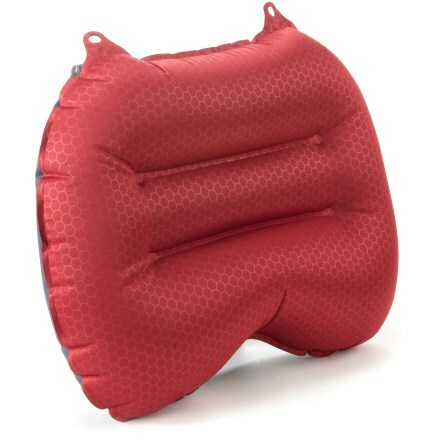 I ordered the Exped Air Pillow. I had read a lot of great things about the pillow as a pillow (comfort) and thought that it sounded worth while to try out. However, my concern was that since it is an air-filled pillow, would it feel like I was laying on an inflated Ziploc. At least the Kelty is a true pillow. As far as the other two concerns, the Exped Air Pillow is listed as 7 oz lighter than the Kelty Camp Pillow, and packs down to about a third the size of the Kelty pillow! The pillow arrived today, and I must say that I am impressed so far. The pillow is tiny when it is deflated. Stuffed (or should I say rolled) in its stuff sack it is only slightly larger than my hand. And my scale shows that the pillow and the stuff sack weighs 3.2 oz. So, this thing really is tiny. Inflated, the pillow is large enough to be a comfortable enough pillow, with a listing of 15 x 10.6 x 4.3 inches. There are two valves on the back of the pillow. One is an inflate while the other is a deflate valve. The pillow takes two full breaths for me to inflate, but if I need it firm it will take an extra breath. So, at this point I am happy with the pillow, however I have not put it to use yet, which is where the details will really matter. So, I will be sure to post back after I have used it some and update on the true comfort level. This entry was posted in Gear, Pillows and tagged Air Pillow, Exped, Kelty Camp Pillow. Bookmark the permalink.